You have options when it comes to your retirement account. In addition to the 401(k) that might be offered at your workplace, you can also open an Individual Retirement Account (IRA). This helps you add a little more to your nest egg each year, boosting your retirement savings. You can contribute up to $5,000 a year to an IRA (Traditional or Roth), plus make a ‘catch-up’ contribution of an additional $1,000 if you are over 50. The amount you can contribute each year adjusts over time, so in the future you should be able to contribute more as inflation becomes a factor. With the Traditional IRA, you make contributions on a tax-deferred basis. This means that you don’t pay taxes on the money you contribute right now. The money is taken out before you pay taxes, effectively reducing your income for tax purposes. This is an advantage right now, since it means you don’t pay as much in taxes (or you get a bigger refund). Your money grows over time, and you don’t have to pay taxes on the earnings from your investments until you withdraw them during retirement. You can start withdrawing money penalty-free at age 59 1/2. You can withdraw as much or as little as you want, until you reach age 70 1/2. At that point, you will be required to make a minimum withdrawal each year from your Traditional IRA account, and pay taxes on the money. 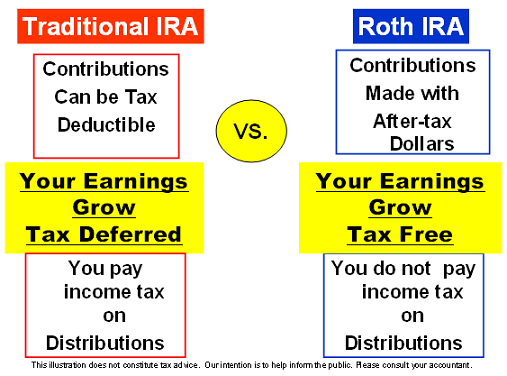 The Roth IRA has the same contribution limits as the Traditional IRA. However, there are income requirements to meet. Each year, the requirement changes, but for 2012, your ability to contribute begins phasing out at $110,000 for singles and $173,000 for married couples. You can’t contribute at all if your MAGI is greater than $125,000 (single) or $183,000 (married). The main advantage to the Roth IRA is that your money grows tax-free. You have to make your contribution after you pay taxes. So, you don’t get a tax advantage right now for contributing to a Roth IRA. However, you do get a tax advantage later. Since the money grows tax-free, you don’t have to pay taxes when you withdraw from your Roth IRA during retirement. If you think that you will be subject to higher taxes during retirement – through higher taxes in general, or moving up to a higher tax bracket – a Roth IRA can help you lock in a lower tax rate, now by paying on your income at the lower rate, rather than a higher rate down the road. Another advantage is that there are no required minimum distributions with a Roth IRA. When you reach 70 1/2, you aren’t forced to take a distribution if you don’t want to. Carefully consider your options, and your eligibility. Decide which type of IRA is likely to most benefit you, and then open an account and start saving for retirement.